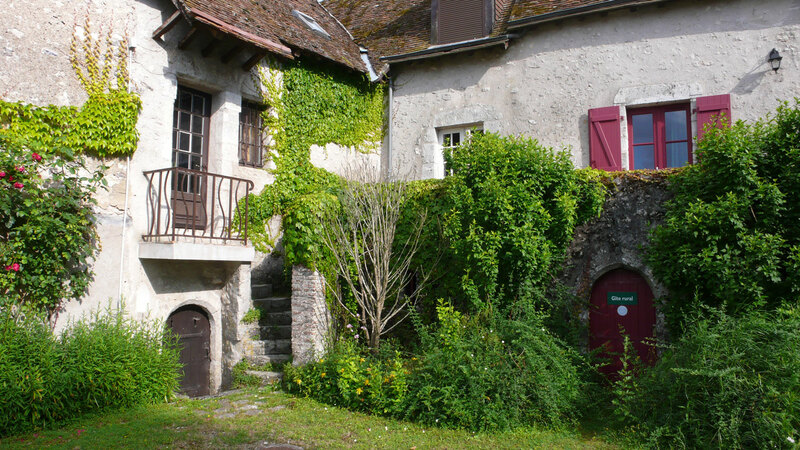 When we used to live in Fontenay sous Bois, we usually went cycling along the Marne River three or four times a week in the summer. We’d take our bikes to Bry sur Marne on the back of the car then ride down to the old Meunier chocolate factory at Noisiel and back. Most of the way, it’s a bike path with houses on one side and the river on the other and woods at the end. Often we’d take a picnic or stop off for a côte de bœuf at La Pergola. When we moved to Paris, I really missed it. But we think we’ve found an equivalent near Blois. Today we took our bikes over to the other side of the river about 7 or 8 K from Blois and parked near the bike path which runs along the river banks. 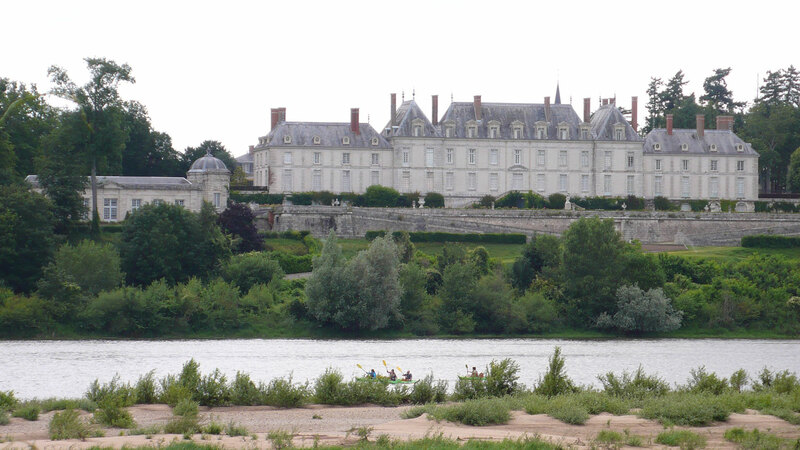 The Loire is not like the Marne which is a navigable river and has stabilised banks. The Loire has a lot of sand banks and is mostly untamed. We were surprised to discover that the bike path is tarred and almost like a carpet most of the way! One of the first places we came to was Menar Castle which were had seen close up from the other side and was not very impressive. But the view from across the river is stunning. 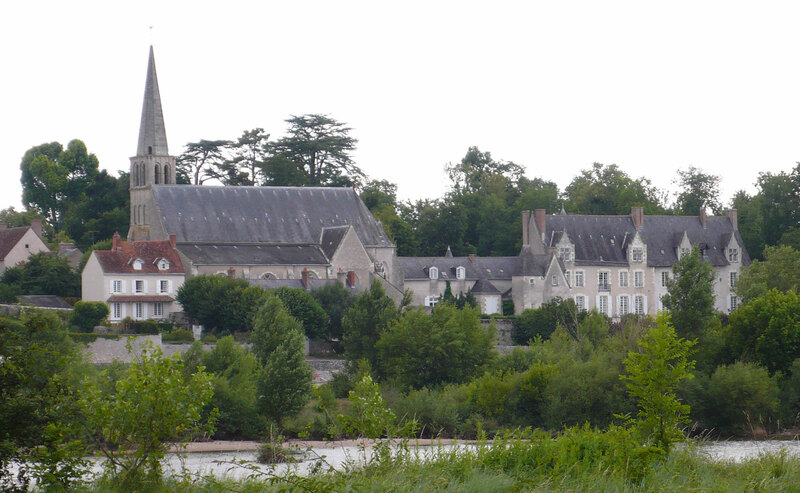 Just afterwards was the lovely little village of Cour sur Loire with its castle and church. But Saint Dyé was the highlight of our ride. It was once a walled city and has an immense church overlooking the Loire. 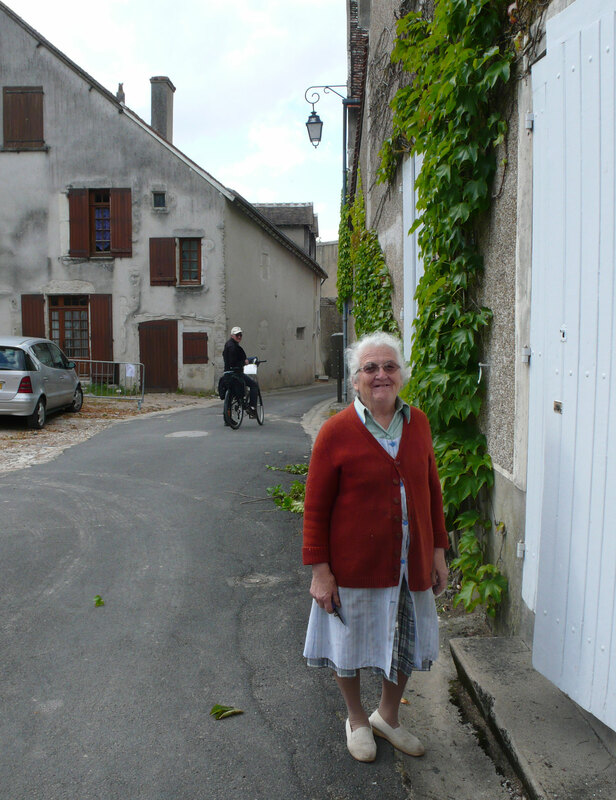 We rode up into the village and through the quaint little streets with their pretty cottages. We saw a little old lady not a day under 80 outside cutting her Virginia creeper. I hesitated to take a photo but she gave me a toothy grin and said “photo?”. So I didn’t hesitate! 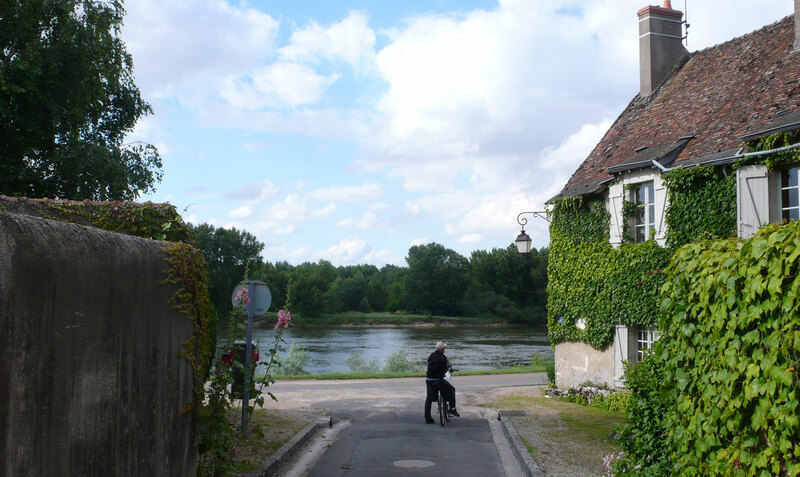 We rode back down to the banks of the Loire and along the old tow path until we came in sight of the Saint Laurent des Eaux nuclear power plant and turned back for obvious reasons. We hadn’t aken a picnic because we didn’t know if there were any tables along the way and after cycling for 20 K, a picnic on the grass is not my idea of comfort. I was rather hoping we’d find a restaurant with a river view of river but the only thing we saw was a bar inside a horse riding school. I reckon that would be worse than sitting on the grass. The views as we rode back were quite beautiful. The sun had come out (it was spitting very lightly when we set out) and made the water sparkle. So we decided to go home and picnic in the garden instead. 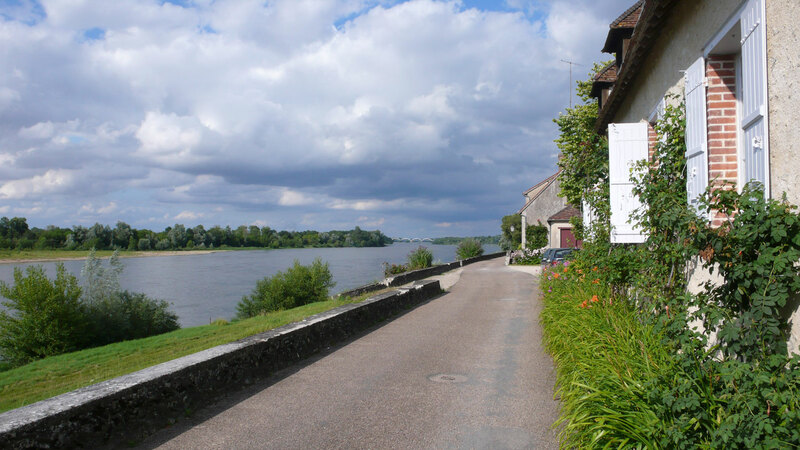 This entry was posted in Cycling, Loire Valley and tagged château de menars, cours sur loire, cycling in the Loire, saint dyé sur loire. Bookmark the permalink. hi Fraissie, I’m so impressed with the riding you do, I’m even thinking of going back to more riding myself. I did a lot when I was young. My only trouble is that where I live is so hilly so I have to look at how I can transport my bike. My son, lives outsiden and has taken up triathlons inhisnlate thirties and rides up holland down dale quite happily. I’m off to Toowoomba tomorrow as Dean is 41 on 9 September, having a son in his forties really makes you think. I’m really looking forward to meeting again when you are here. P.S. Paid for my flights today – so exciting. PPS. I am so in awe of all the wonderful travel you have done. Hi Lyn, you should do what we do – get a good bike trailer and drive to the best spots! I began with a very short, very flat run and went from there. My son is about to turn 31 and I think that’s pretty astonishing. I was talking to him on skype today and suddenly realised I’ll be seeing him in less than a week! It’ll be great to catch up. And, yes, travel is one of my great pleasures in life!